...parts of which are set to appear on a facelifted version of the mid-range SUV due in 2019. ...and the rear one is described as being more performance orientated, with a greater emphasis on the mid to high-load range. 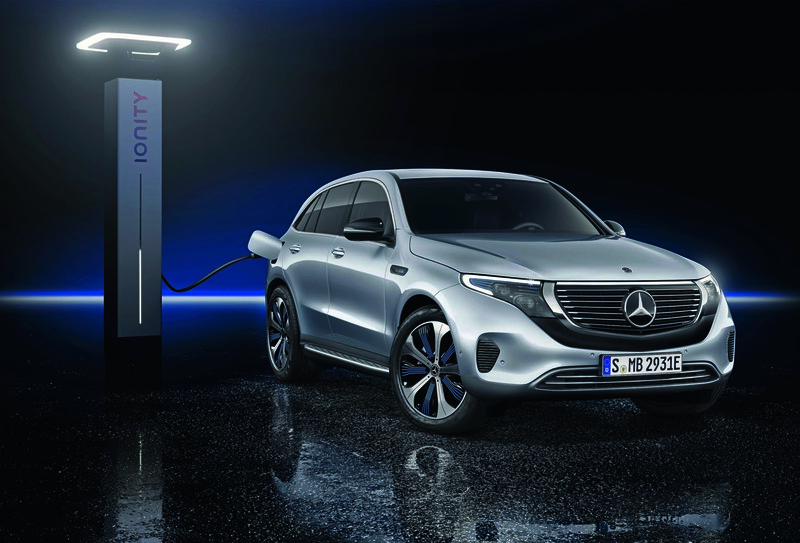 Mercedes-Benz has revealed the first of up to 10 new pure-electric models due before 2025 with the unveiling of its eagerly awaited EQC. 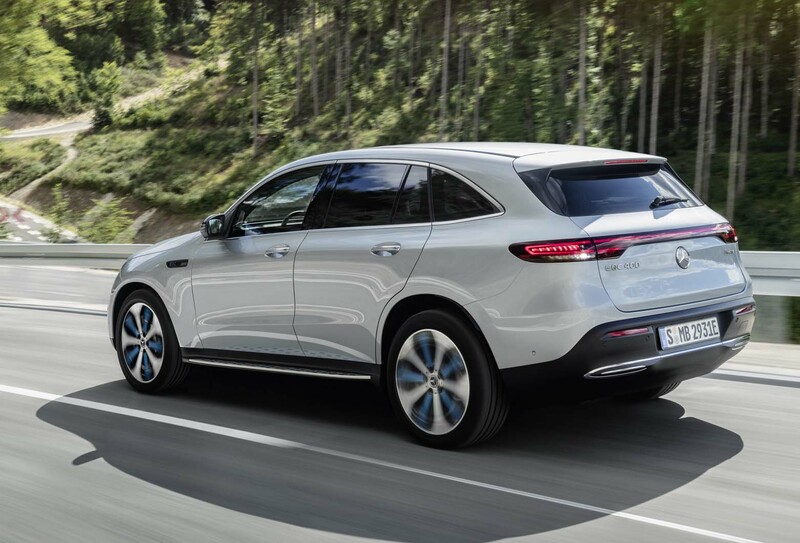 A key rival to the Jaguar I-Pace, Tesla Model X and upcoming Audi E-tron Quattro, the new five-seat EQC SUV is the first dedicated electric Mercedes model to enter series production. The EQC is based around a heavily modified version of the GLC platform. It made its first public appearance post-reveal at the Paris motor show. Stylistically, it leans heavily on the early Generation EQ concept of 2016. It retains the same basic shape and five-door layout of the earlier concept, albeit with altered detailing such as the front-end design. Autocar understands that the EQC achieves a drag coefficient of less than 0.30. At 4761mm long, 1884mm wide and 1324mm tall, the EQC is 105mm longer and a considerable 315mm lower than the GLC, with which it shares its 2873mm wheelbase. Inside, the new model uses an upgraded version of the GLC’s cabin, parts of which are set to appear on a facelifted version of the mid-range SUV due in 2019. 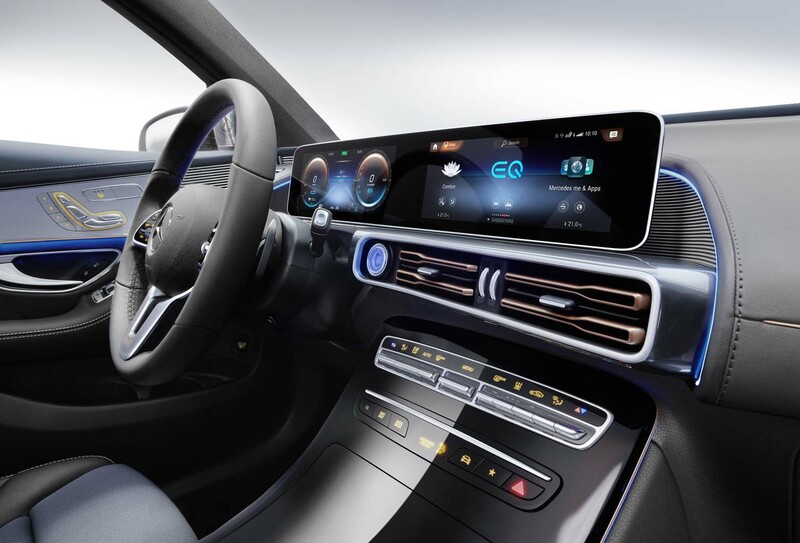 These include a newly designed dashboard with a digital instrument and infotainment panel, reworked ventilation units and a new multi-function steering wheel featuring touch pads within the horizontal spokes. With seating for five and 79 litres more luggage space than the GLC, at a claimed 500 litres, the EQC will count versatility as one of its strongest selling points. The EQC is powered by a newly developed electric drivetrain that’ll be used across the EQ range. Initially previewed in the Generation EQ concept, it consists of two electric motors – one powering the front wheels and another the rears – that enable four-wheel drive capability, depending on the driving mode. They deliver a combined 402bhp and 564lb ft to move the EQC’s 2425kg kerb weight. By comparison, the 395bhp Jaguar I-Pace weighs 2130kg. Each of the EQC’s motors is configured differently: the front one is tuned for efficiency in the low- to mid-load range, and the rear one is described as being more performance orientated, with a greater emphasis on the mid to high-load range. Rubber subframe mounts for the motors endow the EQC with class-leading refinement, according to Mercedes-Benz. In Sport mode, the EQC will sprint from a standstill to 62mph in 5.1sec. Top speed is limited to 112mph. In a display of the car’s versatility, Mercedes also claims a towing capacity of 1800kg and a 515kg payload. Energy to power the motors is supplied by an 80kWh battery. All up, the lithium ion unit weighs 650kg. With a claimed range of 280 miles on the current NEDC test cycle (which is being phased out) and 249 miles on the WLTP cycle, the EQC can’t quite match the 336-mile NEDC and 292-mile WLTP claimed range of the I-Pace, which features a larger, 90kWh battery. That should translate to around 200 miles of real-world range. A standard 7.4kW onboard charger enables AC charging via either regular mains or high-voltage public charging stations. Under DC charging, the EQC’s battery can be charged from 10% to 80% at up to 110kW in around 40min. The EQC will be produced at Mercedes’ Bremen plant in Germany and a joint-venture factory in Beijing, China. UK examples will be made exclusively in Bremen. Prices are expected to start at around £67,500, which would put the EQC on par with the Audi e-tron and Jaguar I-Pace. UK deliveries are estimated to begin in Q3 2019. 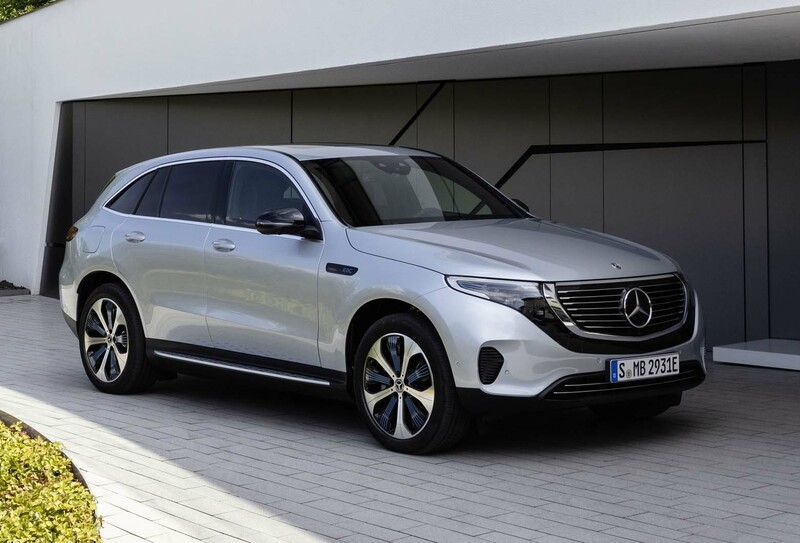 Mercedes said it constructed more than 200 prototypes of the EQC in a programme claimed to have covered “several million kilometres across four continents”. So it looks like Mercedes’ first committed stab at a proper EV will weigh more than a Tesla Model S and a Jaguar I-Pace — and, with 80kWh of battery capacity, may very well not offer quite as much real-world cruising range as either. We’d be foolish to make any judgements about it on the basis of such preliminary information, or without knowing for sure exactly how Mercedes will be pricing the car, but that’s probably not the greatest of starts for it to have got off to. I like the sound of the car’s motor configurations, though. It certainly makes sense to me to vary either the size of the motor at each axle, or its gearing, or both, in order to optimise performance and energy efficiency throughout the speed range. And Mercedes’ claim is promising, too: that this motor strategy will boost the car’s handling dynamism, with the bigger and more powerful motor being at the rear, and perhaps only called upon when the car is in Sport mode or being driven under high load. Back end is tidy but highly derivative. front is really ugly, does not need that horrid chrome band around the odd shaped grill, looks like something very old school Japanese or Korean. The huge tablet screen is crazy, just below the eye-line without shrouding, even dimmed, good luck driving in the dark with a full length fluorescent tube just below the windscreen. I understand why, it makes left/right drive versions easier/cheaper as they just glue it on the other side but yuck. £67K+ for no more range than a £25K Hyundai. Exactly my thought. Just another Mercedes which is fugly and lacking any sort of imagination, much like all Mercedes drivers. Needs to go on a diet. Not exactly elegant. Frumpy. Not as stylish as the I-Pace but much more practical. 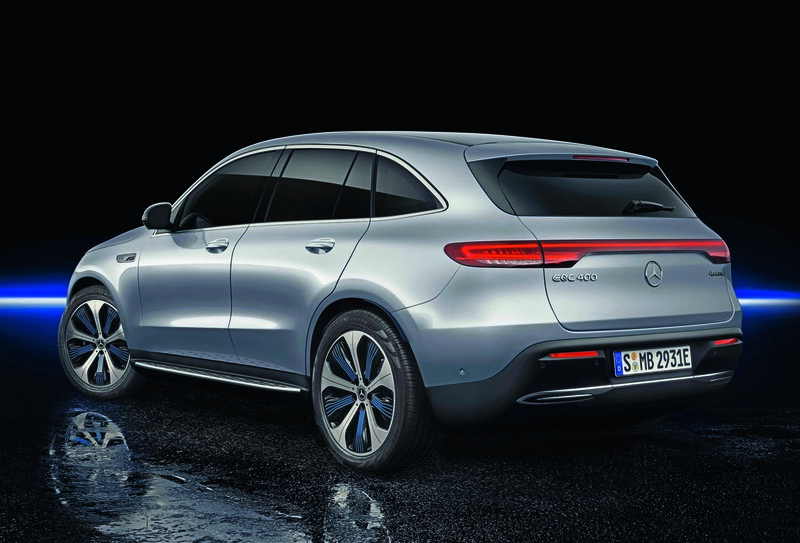 Its an opening gambit for Mercedes, but have a feeling it will be trumped in all areas by the Audi E-Tron. A £67K starting point means an £80K+ car. That's £30K more than a well equiped GLC 43 - and that's a lot of petrol. That crinkle at the rear pillar isn't stylish. The front is montrous. It’s a bit of a minger, at least to my eyes. It feels a long way behind the Jaguar I Pace which increasingly feels like the class leader. It’s roomy for sure but the I Pace isn’t exactly impractical. Im looking forward to the I Tron from Audi but right at this moment in time Jaguar has set the bar quite high it seems. If this car was 132cm tall, it would be lower than a C-Class Coupe. It's 162cm tall, just 2 cm ( so, about an inch ) lower than a GLC. motoring journalists inability to understand dimensions is a pet hate of mine. I wish they’d carry a 300mm/30cm/12inch/foot long ruler with them so they could see how significant a ‘huge 60mm’’ gain in length over a previous model etc really is. Of course you do, because it's not even hard. I've lived my whole life with the metric system, but i still know what an inch is and what a foot is, and i don't deal with either unless i'm on the internet. You'd imagine someone who calls themselves jounalists ( and who have to talk about dimensions ) to actually know what they're saying. ...that the electric motors need rubber sub-frame mounts. In styling terms, standard, boring, German SUV with no attempt to do something a bit different like Jaguar. Also, why does it need to weigh around 300KGs more than the I-Pace?